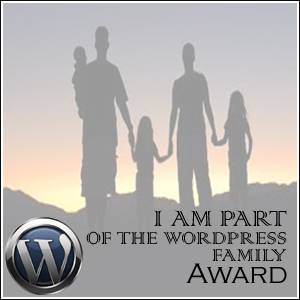 Thank you Sue at Dreamwalker’s Sanctuary for sharing the WordPress Family Award with me. While I have not known Sue long in 3D time, I feel like we have begun to build a lovely rapport that exudes compassion, understanding, and familiarity. Please spend some time at Sue’s sanctuary and you will be better for the experience! 3. Display the text in Red as I want people to know why I made it. By now you know that I like breaking or tweaking rules to suit my values or preferences. In this case I only want to make one adjustment. Shaun says to nominate people you look to as almost family. I wonder, ” Why not include those that are family?” Having spent yesterday with family of blood and legality, I can assure you that true family transcends these limitations. Family for me is a network of support, trust , and genuine affection. Where and how one cultivates this group is up to you. I have been blessed to discover some family members right here in the blogosphere. While I have not shared turkey with any of them, we have feasted together heartily on dishes of truth, healing, empathy, ideas, shared values, adventures, laughter, generosity, self-expression, tolerance and the most genuine affection. We are kin in the truest sense of the word. Shaun mentions this award being part of his legacy. While spending time yesterday with a family that is multigenerational, I pondered about the continuity of life and what forms it may take. I do not know how my writing will stand up after I pass on. I do not even know if it will still be here. But the connections I forge contain that precious Divine spark. That spark is powerful enough to ignite a flame that can never be extinguished. You may ask how I can say this with certainty. Love spreads from one form of consciousness to another, carrying with it traces of all that we loved before. As I type these words I realize that they did not originate with me. I take that as a sign that all is well. To my WordPress family of bloggers, followers, and readers: I cannot list everyone who has graced these pages with your presence simply because I do not know all of you by name. Nevertheless, you are all welcome to take an award. You are part of my family. I will formally invite a few folks to take this award and honor Shaun’s vision. Some of you do not accept awards. Some of you say you do and forget to display the award. I figure that even if you do not participate literally, that you will be okay with being listed here, because that’s how families roll at litebeing chronicles. We make allowances for difference and still respect each other’s boundaries. Isn’t it nice to know at the end of the day that someone really has your back? These women will offer kindness along with the truth. They are independent yet kind, talented yet humble, curious about the what lies within and what lies ahead. They are spiritual warriors. Thank you Sue for including me and allowing me to find sanctuary in your heart. Is it important for you to create one? For my American friends: got any leftover pie to share? How did you find this somewhat old post? As I get older, i think more about my legacy, but honestly with all the Scorpio stuff, I have always been obsessed about death! Not sure what my next post will be, but hopefully something around the Solstice. This quote made me think of your blog. that is beautiful Ka, thank you! Thanks Barbara for the reminder and being part of my family. 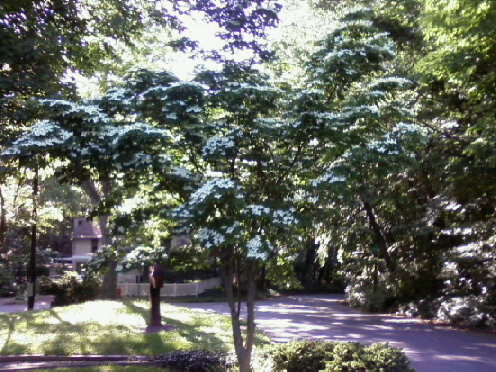 Such a beautiful post Linda, I had to come by in person after reading in my phone email… As I was not going to come on line today.. Loved all the comments here, 🙂 and was so interested in reading them all after your beautifully put together post..
We are now pulling the web our our connections ever tighter as our memory of being a Warrior of Light comes to the fore of our lives.. We are each of us creating a legacy of sorts in that our thoughts and actions spiral out into the consciousness of the world… Where by even if we are not aware of it.. We spread out with our vibration the ripple effect of Love, Gratitude, caring, compassion, healing and Kindness…. These are our legacies Linda, and I thank you for spreading yours for you are a light-being come to do a job and we are all of us held within the Family of Light and Love… We are One.. Thanks also for setting such a fine example by leading the way and giving me this award that inspired my post. Thank you, my wonderful, beautiful friend. I am just speechless and tears of gratitude and joy are rolling from my eyes. It is so sweet and certainly a blessing to be considered part of your family and all above my sisters. We are truly blessed. Thank you Linda! If I have a legacy it is yet to be seen. My friends would miss me and remember me fondly, so I suppose that is it, for now. thank you for your kindness and strength. They go hand and hand. I don’t think it is as important for me to create one as it would feel good that I do. Wouldn’t it be amazing to come back in a different body…but same soul and to come across something we have left behind…and have this sense of complete familiarity with it?!? freaky awesome in fact 😀 For me the most important would be to know that I am evolving..that I am meeting with the lessons I, as a soul wanted to experience and learn in this life time…that for me at this moment is more important. Hmm..definition of family…I honestly don’t know. I actually prefer friends…..hmmmm…. Can I have some pie too??! I do not think we get to decide our legacies, but we can do our best to make a positive contribution while we are alive, I do not understand what you meant exactly with the energy grids, but I do hope my stories leave positive ripples. I don’t think it is as important for me to create one as it would feel good that I do. Wouldn’t it be amazing to come back in a different body…but same soul and to come across something we have left behind…and have this sense of complete familiarity with it?!? freaky awesome in fact 😀 For me the most important would be to know that I am evolving..that I am meeting with the lessons I, as a soul wanted to experience and learn in this life time…that for me at this moment is more important. – My response to this is – WOW, and what if we find as writers that we were writers before and uncover some of our former writing now?? ?